I really love dumplings. A lot. 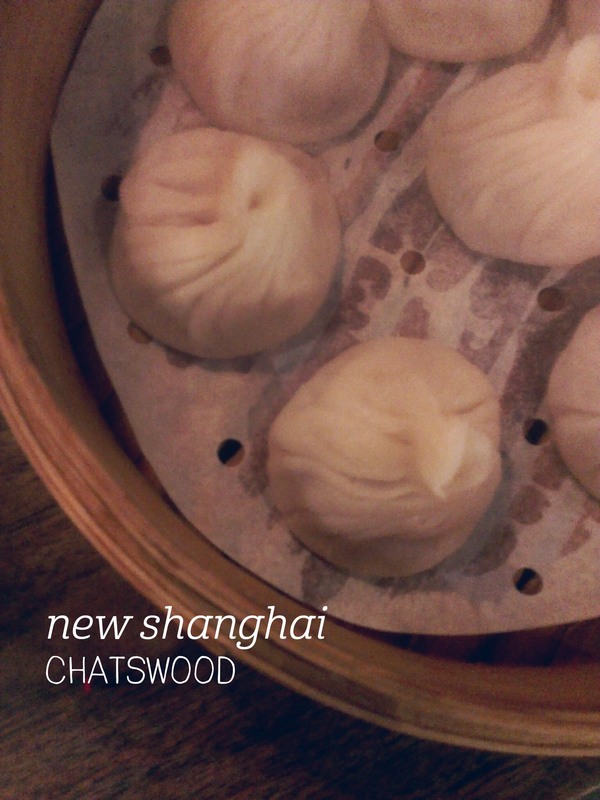 So on a recent visit to Sydney I took the opportunity to spoil myself at New Shanghai in Chatswood Chase. There was about a 10 minute wait for a table, but once inside we were seated at benches and got stuck into ordering. My first pick was the pork xiao long bao – they’re reliably good here, with a vibrant broth and just the right amount of filling. The menu warns to open the dumpling before eating to avoid burns, and I second this advice! The soup inside is hot! Next up was the shallot pancake, which came with four pieces, perfect between two. Not even close to being healthy, these were thin, crispy and utterly delicious, although I had a bit of order envy looking at the couple next to us who had the pork belly bao – definitely getting this next time. We had two more plates of dumplings – prawn wontons with peanut butter and chilli oil, and the prawn duplings. The former were much better than the latter, with a real kick from the chilli and pieces of prawn inside providing a good textural contrast. I’ll be back to perfect my order! Broddogs is one of the more prominent, well-known food trucks at The Hamlet, originally set up in Belconnen, and I couldn’t go past it for my first visit to the food truck enclave. On recommendation from Fine Eating, I went for the Omi Dog – vienna frankfurt with a salad of onion, gruyere and mayonnaise dressing – and a side of chips. I waited about 5 minutes for my order (not bad at all really) and the first thing I noticed when sitting to eat was that the bun of the hot dog was hot, but the filling wasn’t. It made for an interesting contrast, with the sausage sliced up and mixed through the cold salad. I liked the raw onion flavour cutting through the otherwise creamy salad, but probably won’t order it again on a work day! The hot dog was very filling and the bun was nice and soft. Note to self: the serve of chips is massive and should be shared. They’re the same shoestring fries as Brodburger, with some magically delicious seasoning and no dipping sauce required. 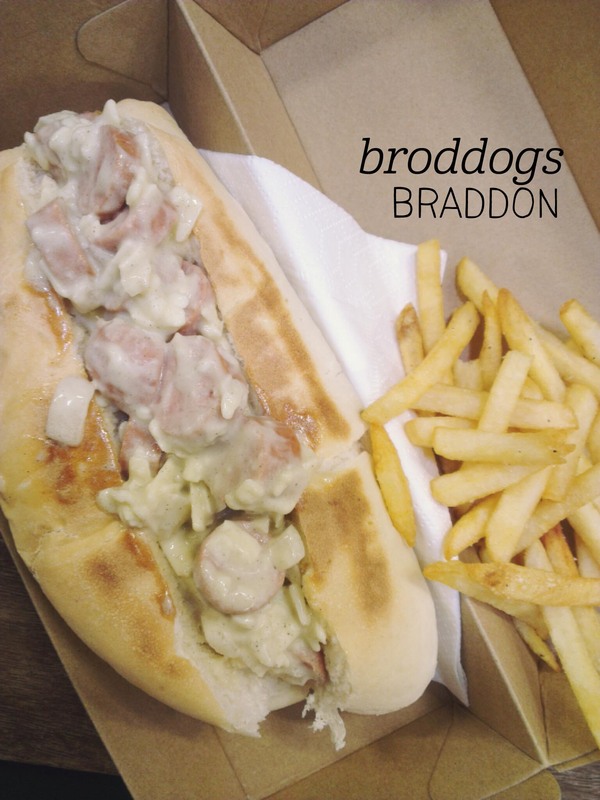 Whilst not as blow-your-mind good as Brodburger, Broddogs offers an affordable, filling hot dog served fast. 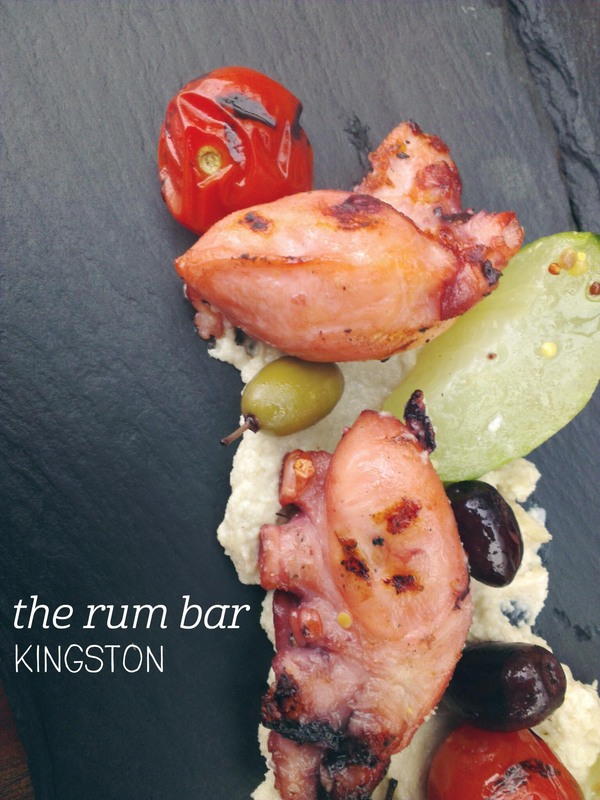 I met a friend for drinks at The Rum Bar on a Tuesday night and we were delighted to discover that they also offer 2-for-1 tapas on Tuesdays, making their dishes very good value. After ordering our drinks (wine for my friend, Captain Morgans with Coke and lime for me – try it, it’s amazing! ), we browsed the food menu and picked one plate each to share. The food didn’t take too long to come out, and it was no hardship sitting outside admiring the waterfront while we waited. The pork belly with pumpkin, walnuts and ricotta salata came out first – it was beautifully presented on a stone plate with the pumpkin puree smeared underneath the two pieces of pork. We cut them up to share and I thought the pops of nutty flavour really made the dish. The pork itself was lovely and tender with a comforting roast flavour. Our other dish was the octopus with almond gazpacho, olives, compressed cucumber and tomatoes. I adore octopus and these pieces were thick but very tender, and went perfectly with the almond gazpacho. The olives were very small but the cucumber added a fun flavour (more like a pickle). I really enjoyed the light food and the fabulous view – try it sometime. First international #icecreamthurs! 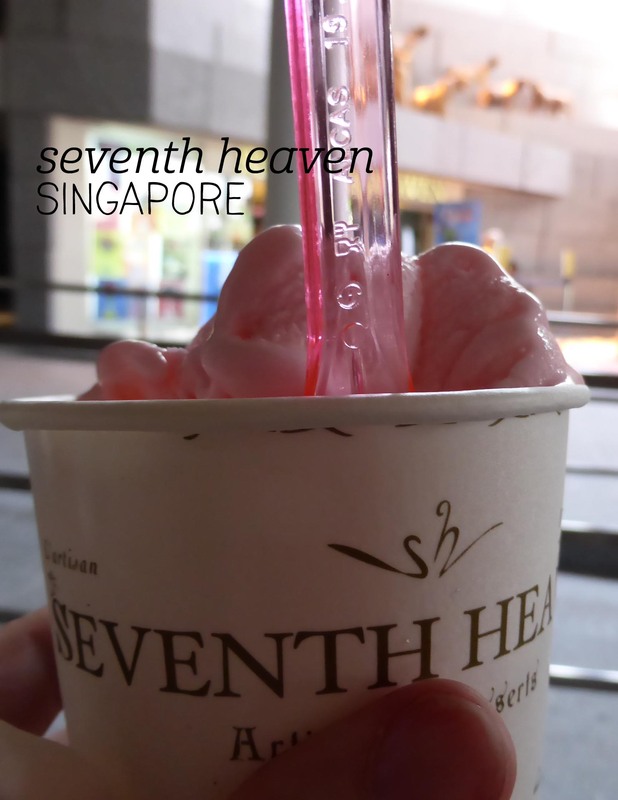 Singapore is exactly the kind of place where you find yourself wanting icecream. We’d walked a long way in the humid heat to visit the Gardens by the Bay, an incredible botanical garden with huge indoor displays and an impressive array of plants. In between the Flower Dome and the Cloud Forest was an outdoor rest area, which by the time we’d wandered through the Flower Dome we very much needed to take advantage of. I was admiring the life-sized sculpture of a pride of lions looking down on visitors when the sign for Seventh Heaven caught my eye. Yep, it was a gelato stall, right there waiting for us! There were a few flavour choices, but being adventurous (and having tried it before in Tokyo), I chose the sakura/cherry blossom flavour. Sakura is (obviously) a floral flavour, and that came through nicely in the generous (but tourist-site overpriced) serving, without being overpowering as some florals can be. The gelato had that lovely balance between creamy and icy and whilst it melted quite quickly in the heat, each spoonful was refreshing and sweet. A perfect treat for explorers. Note to self: the South Melbourne markets aren’t open on a Monday. 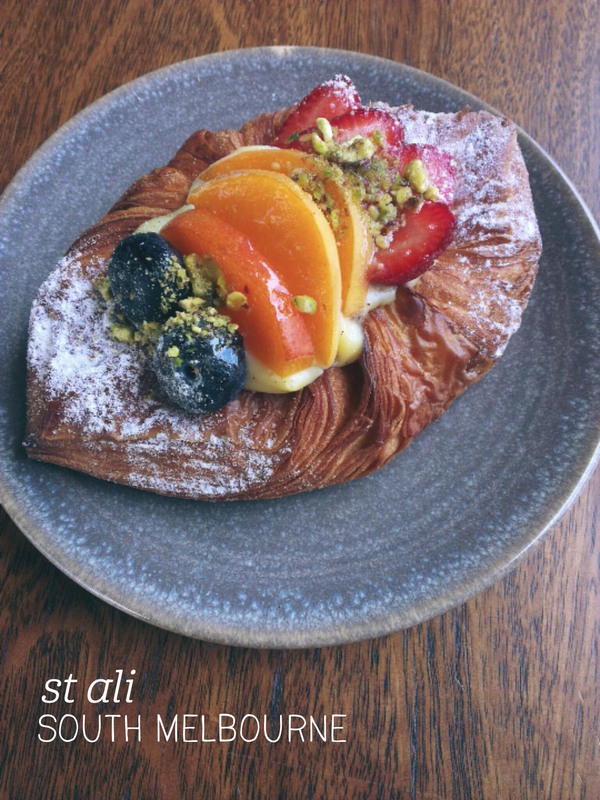 Luckily St Ali is – in fact they’re open 365 days, so you can’t get it wrong (like I did with the markets). Instead of wandering through the markets a friend and I settled in at St Ali for afternoon tea, soaking up the sunshine from their outdoor seating which looks out onto the street. We were both tempted by the cake display and I caved first and ordered the fruit danish and a ‘hydrate’ juice, while my friend picked the lemon and marshmallow tart and a ‘detox’ juice. The juices were served in large, tall glasses and didn’t have much foam – mine had watermelon, apple and mint, although I could still taste the carrot from the detox juice which must have gone through the juicer first. The danish was lovely and crisp, with the pastry flaking off in large pieces to enjoy. The fresh blueberries, apricot and strawberries sat on a bed of custard which brought the whole sweet to life. I could have happily eaten another if it hadn’t been so filling! Definitely a great place to while away an afternoon. Smoque is somewhere I know I can always get a reliable, good value meal, although their food wouldn’t exactly fall into the ‘healthy’ category. This visit was spontaneous, and the three of us ended up ordering the same meal and some sides to share. 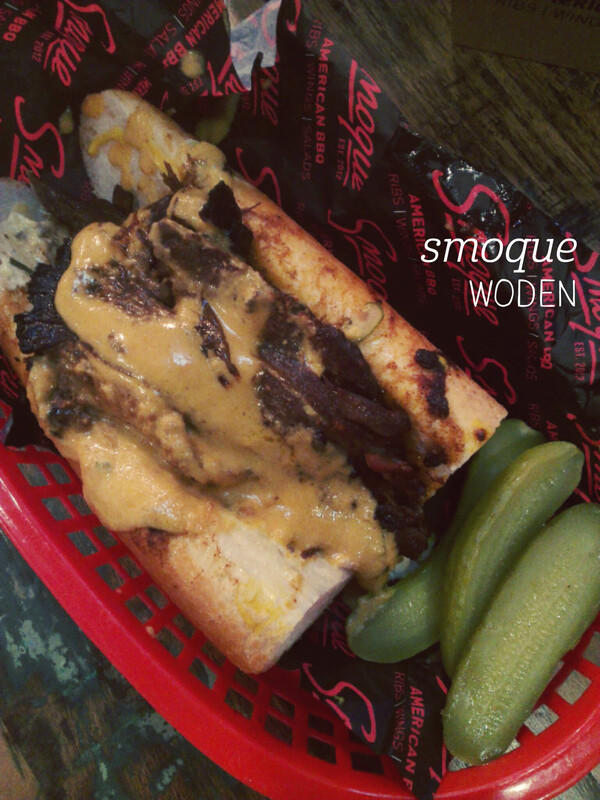 We were all tempted by the Philly Cheese Steak sandwich, with sliced beef, rosemary aioli, caramelised onion and cheese. I ordered mine with pickles, but was disappointed that the extra pickles weren’t half-pickles like the one on the side, but tiny grated mini pickles – not worth bothering with. My friends kindly gave me their pickles (you guys are the best). That was the only disappointment though – the sandwich was incredible. Packed with far more slow-cooked, tender beef than I’d expected, the rosemary aioli was flavoursome without being overpowering, and there was a perfect filling-to-bread ratio. We also had a side of tater tots (better known as potato gems) with spring onion, sour cream and bacon bits – these were tasty but not as tasty as the hand-cut fries, which were wolfed down and went perfectly with the aioli overflow. The relaxed atmosphere was perfect for a casual weeknight meal. 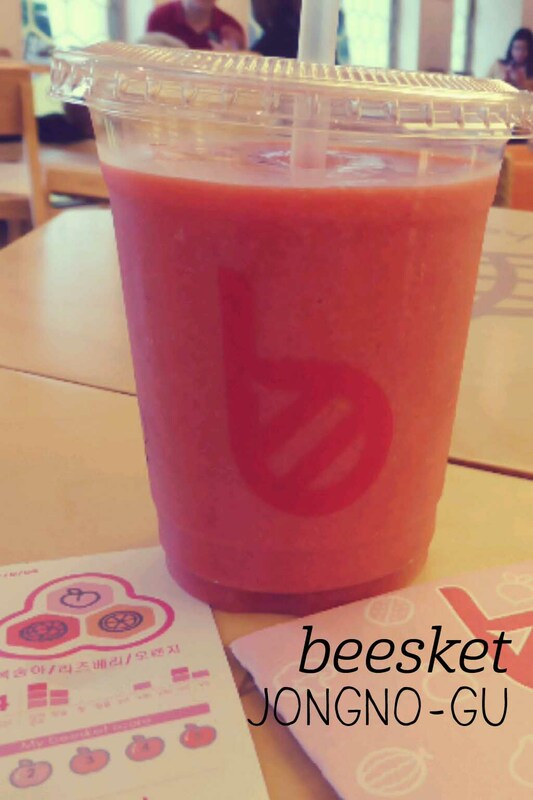 I was so excited to discover Beesket just down the road from our hotel in Seoul – I love a good smoothie generally, but Beesket has such a fun concept it takes the whole experience to the next level. When you arrive, you choose whether you want a smoothie, ‘ade’ or yoghurt, and pick up a little container with spaces to fit three hexagonal pieces (like a beehive/honeycomb), representing fruit or vegetables that you would like in your drink. You can then roam the wall, looking at all the colourful pieces trying to make your flavour combination. My favourite ended up being peach, orange and raspberry, but you could pick anything from tomato to grapefruit (although probably not recommended together). The cafe had lots of seats while you waited for your beesket, which you received along with a little card showing your flavour choices and their nutritional value. You could put your combos up on a pin board in the store to recommend them to others. Note: when researching this post it appears the branch I went to is now closed, but other locations are up on their website.